a spherical surface, if the meridian is a circle, the center of which is located on the axis of the revolved surface (GeomAbs_SphericalForm). Warning Be careful not to construct a surface of revolution where the curve and the axis or revolution are not defined in the same plane. If you do not have a correct configuration, you can correct your initial curve, using a cylindrical projection in the reference plane. C : is the meridian or the referenced curve. A1 is the axis of revolution. The form of a SurfaceOfRevolution can be : . a general revolution surface (RevolutionForm), . a conical surface if the meridian is a line or a trimmed line (ConicalForm), . a cylindrical surface if the meridian is a line or a trimmed line parallel to the revolution axis (CylindricalForm), . a planar surface if the meridian is a line perpendicular to the revolution axis of the surface (PlanarForm). . a spherical surface, . a toroidal surface, . a quadric surface. Warnings : It is not checked that the curve C is planar and that the surface axis is in the plane of the curve. It is not checked that the revolved curve C doesn't self-intersects. Returns the revolution axis of the surface. Returns the parametric bounds U1, U2 , V1 and V2 of this surface. A surface of revolution is always complete, so U1 = 0, U2 = 2*PI. Creates a new object which is a copy of this surface of revolution. Computes the point P (U, V) on the surface. U is the angle of the rotation around the revolution axis. The direction of this axis gives the sense of rotation. V is the parameter of the revolved curve. Computes the current point and the first derivatives in the directions U and V. Raised if the continuity of the surface is not C1. Computes the current point, the first and the second derivatives in the directions U and V. Raised if the continuity of the surface is not C2. Computes the current point, the first,the second and the third derivatives in the directions U and V. Raised if the continuity of the surface is not C3. Computes the derivative of order Nu in the direction u and Nv in the direction v.
IsCNv returns true if the degree of continuity of the meridian of this surface of revolution is at least N. Raised if N < 0. IsVClosed returns true if the meridian of this surface of revolution is closed. IsVPeriodic returns true if the meridian of this surface of revolution is periodic. Returns the location point of the axis of revolution. Returns a 2d transformation used to find the new parameters of a point on the transformed surface. Computes the position of the reference plane of the surface defined by the basis curve and the symmetry axis. The location point is the location point of the revolution's axis, the XDirection of the plane is given by the revolution's axis and the orientation of the normal to the plane is given by the sense of revolution. Raised if the revolved curve is not planar or if the revolved curve and the symmetry axis are not in the same plane or if the maximum of distance between the axis and the revolved curve is lower or equal to Resolution from gp. Changes the axis of revolution. Warnings : It is not checked that the axis is in the plane of the revolved curve. Changes the revolved curve of the surface. Warnings : It is not checked that the curve C is planar and that the surface axis is in the plane of the curve. It is not checked that the revolved curve C doesn't self-intersects. Changes the direction of the revolution axis. Warnings : It is not checked that the axis is in the plane of the revolved curve. Changes the location point of the revolution axis. Warnings : It is not checked that the axis is in the plane of the revolved curve. Applies the transformation T to this surface of revolution. 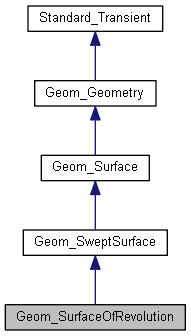 Computes the parameters on the transformed surface for the transform of the point of parameters U,V on <me>. Computes the U isoparametric curve of this surface of revolution. It is the curve obtained by rotating the meridian through an angle U about the axis of revolution. VReverse reverses the meridian of this surface of revolution. VReversedParameter returns the reversed parameter given by the function ReversedParameter called with V on the meridian.